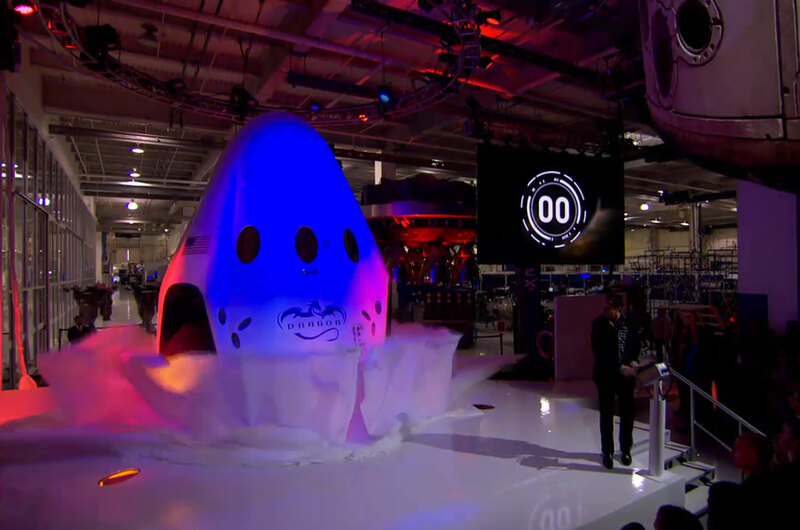 — Revealing what he described as a "21st century spaceship," Elon Musk unveiled SpaceX's Dragon V2, the commercial spaceflight company's first spacecraft designed to fly astronauts, during an event held Thursday night (May 29). 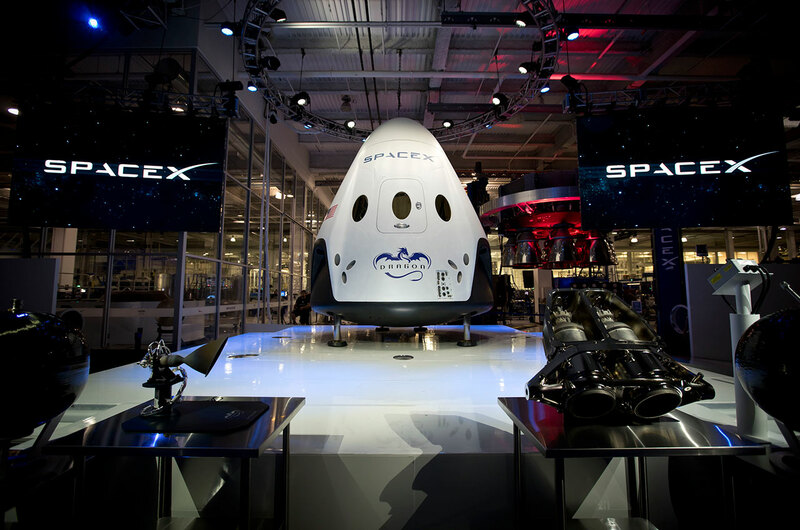 "There you have it, Dragon Version 2," the billionaire CEO and chief designer told an audience of employees, invited guests, and media gathered at the company's Hawthorne, California headquarters. "[It is] capable of carrying up to seven astronauts, propulsively landing almost anywhere in the world, and is designed to be fully reusable so you can fly it multiple times, allowing a potential dramatic reduction to the cost of access to space." 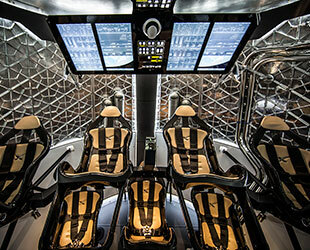 The streamlined space capsule, intended as an upgrade to the company's current Dragon used to deliver cargo to and from the International Space Station, features a flat-panel dashboard, leather-lined bucket seats, the world's first 3-D printed engine and landing legs. "We wanted to take a big step in technology," said Musk, explaining that they wanted to "create something that was a step change in spacecraft technology." 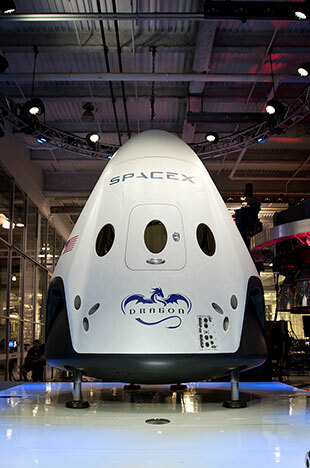 Designed to launch aboard SpaceX's Falcon 9 rocket, the Dragon V2 swaps the two solar array wings of the Version 1 capsule for integrated panels lining the spacecraft's rear unpressurized cargo trunk. The V2 will dock autonomously to the space station, rather than needing to be captured by the outpost's robotic arm, and instead of splashing down under parachutes, it will fire its engines and deploy legs to touch down on land. "You'll be able to land almost anywhere on Earth with the accuracy of a helicopter," Musk said, "which is something I think a modern spaceship should be able to do." The Dragon V2 capsule still retains the parachutes of its predecessor, which it will deploy if an in-flight engine check "a few miles before landing" detects any problems. 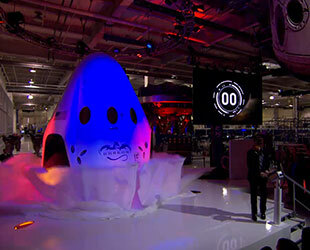 Even so, Musk said, the capsule can land safely even if it loses the use of two of its SuperDraco engines. "That's how a 21st century spaceship should land," Musk stated. 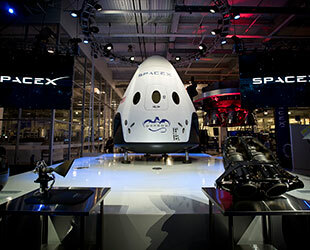 The ability to return to a soft touchdown is not just for the benefit of the Dragon's astronaut crew, but for the future of spaceflight, Musk said. "It enables the rapid reusability of the spacecraft. You can just reload propellants and fly again," he asserted. This is extremely important for revolutionizing access to space," he stated. "So long as we continue to throw away rockets and spacecraft we will never have true access to space. It'll always be incredibly expensive." 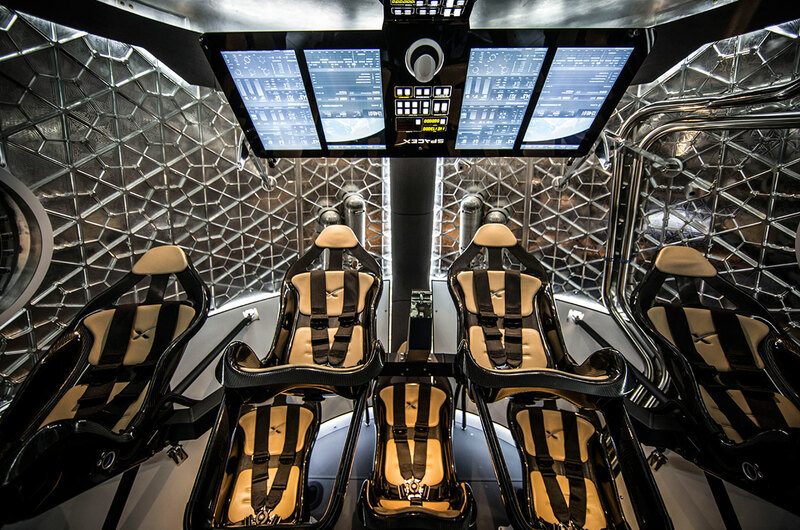 After describing the exterior features of the Dragon, Musk ascended a ladder, lifted the capsule's hatch and climbed into the pilot's seat inside. "We've aimed for something with the Dragon Version 2 for the interfaces and the overall aesthetic of something that is very clean, very simple," he said. "As the pilot, you are able to interact with the screens overhead to control the spacecraft. And then we have all the critical functions that are needed in an emergency situation as manual buttons." The Dragon V2 is SpaceX's bid in a NASA competition to provide commercial crew launch services for the agency's astronauts, replacing the now-retired space shuttle and the current reliance on Russia's Soyuz spacecraft. In addition to SpaceX's Dragon, NASA is also considering Boeing's CST-100 capsule and Sierra Nevada Corporation's Dream Chaser winged mini-spaceplane, with a decision expected by August as to which will advance to demo flights. Musk on Thursday told reporters that the Dragon V2 could launch on its first uncrewed test flight as soon as late next year, with a first piloted flight as soon as mid-2016. NASA wants to begin contracted flights to the station in 2017. The space agency last month signed a 20-year lease with SpaceX for the use of Launch Pad 39A at Kennedy Space Center in Florida, where the company intends to stage its flights of the Dragon V2.